Eight champion huskies awaken one Christmas Eve night to Santa’s sleigh full of goodies. But they aren’t receiving presents yet. The man in red needs help with one final stop. Nome, Alaska, is last on the list and the heavy snow is not letting up. With Rudolph’s nose out of power, someone else will have to guide this sleigh tonight. In the spirit of Alaska’s state sport, this night before Christmas tale is all heart and determination. Nome has been saved by sled dogs before, so it is no coincidence that Santa chooses this pack of pups to brave the arctic weather. It took 150 canines to rush lifesaving serum to the town during the 1925 diphtheria epidemic. But with the blinding snow, the ice, and the overflow, can Santa rely on only eight? It’s a tongue-flapping, tail-wagging adventure as this team tries to save Christmas for one deserving group. Tricia Brown spent more than twenty years in Alaska writing for newspapers in Fairbanks and Anchorage. She served as editor in chief of Alaska magazine before entering book publishing. 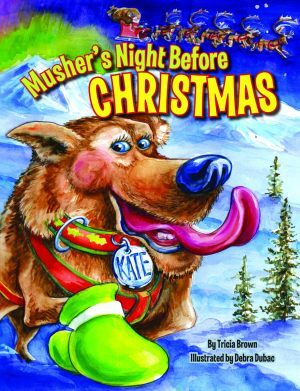 She has written seventeen books on Alaskan subjects, including Alaskan Night Before Christmas, and is the foremost editor of books on dog mushing. Brown holds a bachelor’s degree in journalism and a master of fine arts degree in creative writing. She lives in Scappoose, Oregon. Debra Dubac is a full-time illustrator/designer and mom. Her Alaskan surroundings, and all its natural resources, continuously inspire her to produce colorful expressions of some of the most admired wildlife and nature in the world. Her work has received recognition from the Alaska Press Club, the Advertising Federation of Alaska, and the Society of Professional Journalists. She lives in Anchorage, Alaska.